I know it sounds like a cliché, but I’m honestly having a hard time grasping that Christmas will actually be here in less than a week. I’ve mostly been focusing on WenYu’s homecoming, and thinking about what it’s going to be like cooking for five again. For one thing, leftovers are no longer an issue. We don’t have any! With Meiling at home these past 10 days, we’ve been lucky to save something for YaYu to take for her lunch, and Brett and I (and Meiling) have had to scramble here at home to come up with our own lunches. We’ll be having two big meals this coming week, a turkey dinner tomorrow evening to celebrate WenYu’s homecoming, and then ham on Christmas Day. Both meals will thankfully provide plenty of leftovers to be used going forward. And, in the past, we’ve always had an assortment of hors d’oeuvre for our Christmas Eve celebration, but this year we’ve decided to pick up some tasty items from Pono Market in Kapaa. I’ll still be fixing part of the meal, but my evening should be a bit more relaxed than it’s been in the past. We won’t be needing much from the farmers’ market this week other than some cucumbers and bananas, and maybe some broccoli if we can find it (I have frozen to use for the turkey casserole if I can’t find fresh). Jim wants a ham on Christmas Eve, the kids are on board, so he’s making it! I think macaroni and cheese sounds great, along with potatoes, rolls, etc. A good carb loading holiday ha ha! In your quest for the best mac and cheese, I recently had someone tell me their grandma puts a little mustard in it – I bet that adds a yummy tang! Have a wonderful holiday with your girls home! 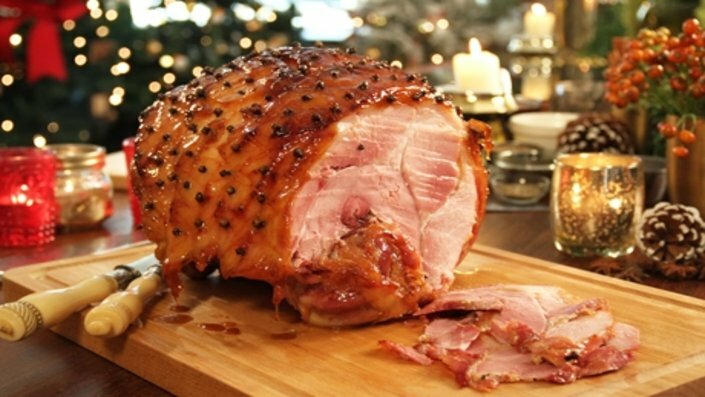 We didn’t get to have ham last year because our son doesn’t like it, so it went to the top of the list this year for our Christmas meal. Macaroni and cheese is the perfect accompaniment. I do add mustard to my macaroni and cheese. Seems like a weird addition, but it really does make the flavors pop! Merry, merry Christmas to Jim and all of your family. Hopefully we’ll be seeing you soon! Your meals sound fabulous! We have gravitated toward easier meals over the holidays since the kids were born. Too much work in the kitchen while jiggling a crying baby, chasing a toddler, or trying to entertain an exhausted 4 year old. Now that the boys are all a bit older, we’ve kept with the more minimalist trends, & love it! Enjoy your time with the girls. I we weren’t at our house, and it wasn’t our first chance in a year to be together, I’d definitely be more of a minimalist as well when it comes to our meals. Christmas Eve was going to be somewhat easy, but that’s changed. I’m going to do a a Chinese feast instead with a few of the girls’ favorites. Still not too difficult, but not as easy as fried chicken from Pono Market! I’m beyond thrilled to have all three of the girls together again! I’m sure you’ll have a great week and holidays! Do you have a special technique or recipe for the roasted asparagus? When I roast asparagus, after snapping off the tough bottom parts of the stalks, I lightly toss the spears in olive oil and then sprinkle with salt and pepper. I roast at 350 degrees (176 C, I believe, if you’re doing metric) for about 30 minutes. I keep an eye on it though, especially if the stalks are thin as they can get overcooked fairly easy. Turkey dinner is may favorite! I will be making a roast turkey, gravy, mashed potatoes or sweet potatoes, vegetarian stuffing, cranberry sauce and a rice pilaf with candied chestnuts for the New Year. I have decided to stay at home and meet the new year on my own sans family this year. Going to Ankara just for the weekend is tiring. Normally, I buy a whole turkey but since, I shall be alone, I will probably buy a half turkey or may be just a leg and a breast. Your turkey dinner sounds fabulous! Are turkeys easy to find in Turkey (kind of weird to write that)? Your rice pilaf makes my mouth water. It’s too hot here to roast an entire turkey, so these days I buy a whole pre-roasted turkey breast. I slice it, wrap in foil, and warm in the oven and it’s delicious (and easy)!